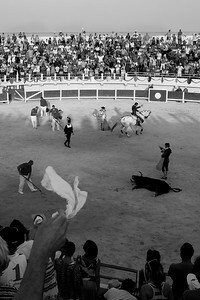 On Bastille Day, 2015 I went to a bull fight at Saintes - Maries - de - La - Mer, in the Camargue district. 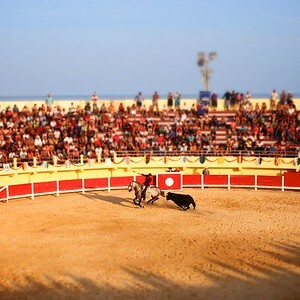 At this event the matadors sit astride horses and then proceed to stab the bulls with razor sharpe blades attached to poles. The skill, I guess is to get close enough to impale the bull on its neck, between the shoulders until it eventually loses so much blood that it can no longer stand. 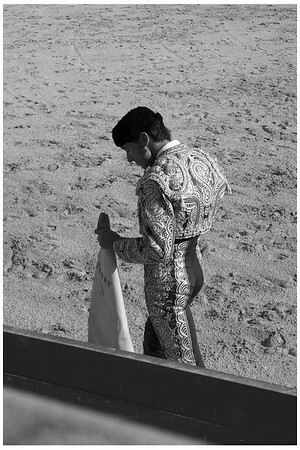 Eventually a final glance to the back of the neck renders the bull unable to fight at which time the matador dismounts and runs a sword into the bulls brain, killing it instantly. Many of the crowd roar in approval, waving white handkerchiefs as a type of salute. I thought it was the cruelest and most barbaric event I had seen. A mismatch . 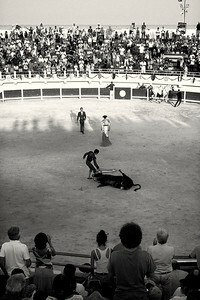 The bull storms in to the arena, confused, scared , de- horned and with zero hope of survival. For around 20 minutes the Matador will provoke and tease the bull which more often than not stands there in a confused, dazed stupor every so often making a faint charge towards the horse. 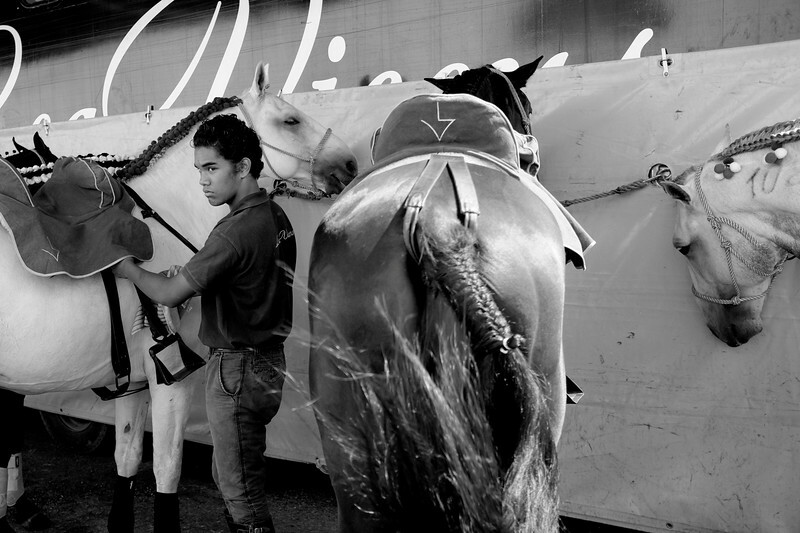 The horses are far too quick to ever be wounded. 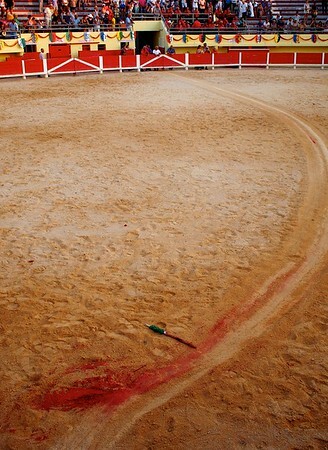 On the day I attended there were 3 matadors each of whom performed twice, so 6 bulls were sacrificed . One of the matadors was so weak that despite being unable to even penetrate the thick skin off the bull she was still deemed a real star after finally wearing it out with half hearted stabs . On another occasion one of the bulls did manage to push one of the horses up against the side of the arena ( creating a babble of concern from the crowd) and while I clapped with delight many of the crowd were quite concerned-for the matador. They looked at me very confused. 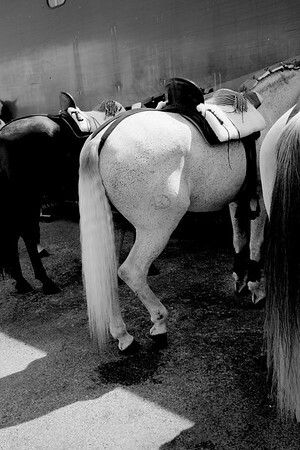 Each matador has several horses all with seperate skills. During a match the matador will change horses several times depending on what he wants to do next.